Breeding plumage. Photos by Julian Heavyside (top) and Brian Starzomski. Key features of this medium-sized shorebird (measuring to 28 cm long) are a long dark bill, long tail, and relatively short and thick yellow legs. It is dark grey above, and has a whitish eyebrow; in breeding season its undersides are barred white and grey, while in winter (and on juveniles) its undersides are white with grey across the breast and sides. Its tail bobs up and down while it walks and feeds, and when disturbed it makes a loud 'tattling' alarm call, consisting of rapid single-note whistles, before flying away. 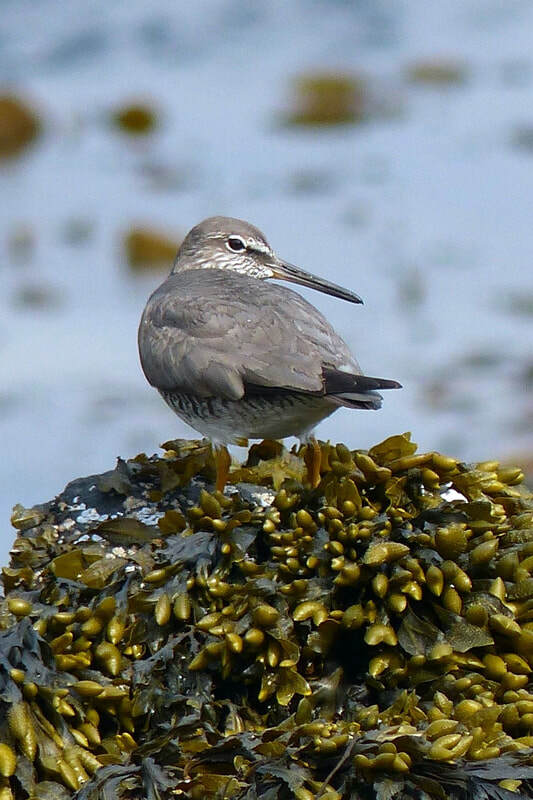 The wandering tattler gets its name from its 'wandering' distribution: its breeding grounds are in the mountainous tundra of northern BC, Yukon, Alaska, and Siberia, while in winter it is found on shorelines throughout the Pacific Ocean. 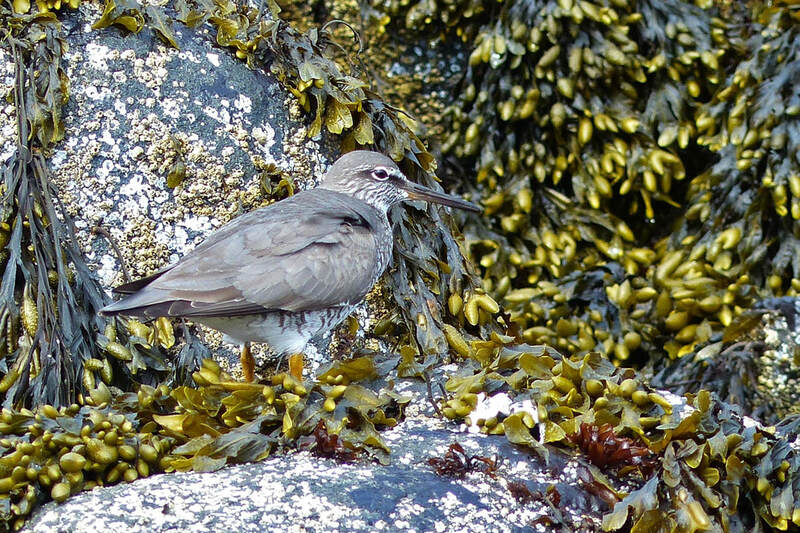 It is usually found on rocky shorelines along the Central Coast during migration, though it may also feed on nearby sandy beaches or mudflats. ​​Shorebirds of similar size and colouring that are also found on the Central Coast include the surfbird (Calidris virgata) and the rock sandpiper (Calidris ptilocnemis). 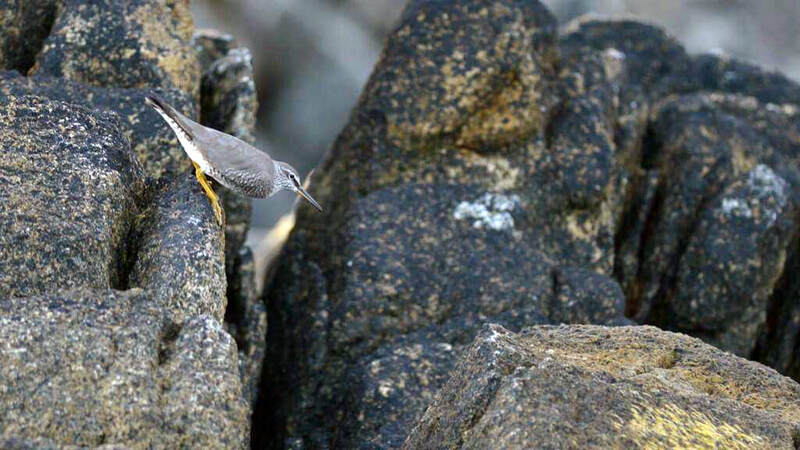 Both are smaller with thicker bills that are yellow at the base, and the rock sandpiper's bill curves downward. Both also have shorter tails, and do not bob their tails like the wandering tattler. Some wandering tattlers migrate south across the Pacific to Australia for winter. Wandering Tattler Tringa incana. Audubon Birds. National Audubon Society. Accessed 03/20/2018. Wandering Tattler Tringa incana. The Birds of North America Online (A. Poole, Ed.). Ithaca: Cornell Lab of Ornithology. Retrieved from the Birds of North America Online. Accessed 03/20/2018. Dunn, J. L. and Alderfer, J. (Eds.). (1999). National Geographic Field Guide to the Birds of North America. (3rd Ed.). Washington, D.C.: National Geographic Society. Pp. 180-181.